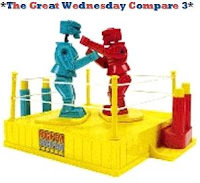 The winner of last week's Great Wednesday Compare (Oscar Wilde Vs. John Updike) with a final score of 4-3 was John Updike. I have to admit, I thought Oscar Wilde was going to finish off the 3rd Wednesday Compare (for those of you new to these shenanigans, a five week winner means everything starts anew). Alas, it was not meant to be. However, I enjoyed reading the comments about Wilde; a lot of very polarized discussion. Is he the "love him or hate him" sort of author? For me, it depends. My introduction to Wilde was with his one and only novel, The Picture of Dorian Gray. Had someone asked me after that, I'd have said I was a fan. However, it's always folly to say you're a fan after just one book and so last year I also tried one of his short stories, "The Model Millionaire." I really didn't enjoy that one at all. Now it's hard to say where I stand. Lukewarm, maybe. This week we move on to another author I've not yet read. Remember, vote simply by adding your comment below, base it on whatever merit you choose, voting does not end until Tuesday at 11:59 p.m. (Feb. 10, 2009), and if you want your author to get more votes, feel free to promote them here or on your blog! Perfect.. the first Wednesday Compare I stumble onto and you feature my most favourite author!! Although I liked Updike's Rabbit books, I loved all 8 of Garcia Marquez's books that I read a gazillion times more.. so my vote is for Garcia Marquez. I have liked almost all that I have read from Marquez. My vote too goes for him! Yeah, Oscar Wilde is gone! Well, I haven't read either of these authors yet but I will vote for Marquez because I'd *like* to read him someday. I adore Updike... however every book that Marquez has published has such a truly magical quality that he cannot be ignored. He's one of my most favourite authors.... as such, my vote goes to him! Marquez. 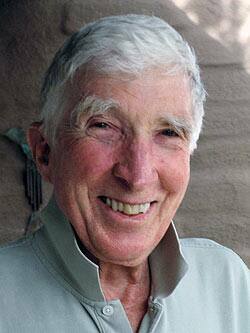 I hate Updike as much this week as I did last week. I guess the wallpaper won, again. i'll vote for Gabe 'cause he's in my "i'd like to read 'im some day" pile, too. Garcia Marquez. 100 Years of Solitude changed my live.